New Nokia Android Smartphones, Arriving in 2017 : Exciting or Not Really? Every time I enthusiastically tell my techy friends that Nokia is finally returning to the mobile industry next year (2017), it's often received with indifference and sometimes, disinterest. One time, a bud who's also tech blogger even replied, "But Mark, it won't be the same Nokia we grew up knowing and loving. They'll just license their name and then some Chinese company will make these so-called 'Nokia' devices. I'm not sure if that calls for a celebration." To be fair, what he said is true. Though, I don't think his statement paints the complete picture. 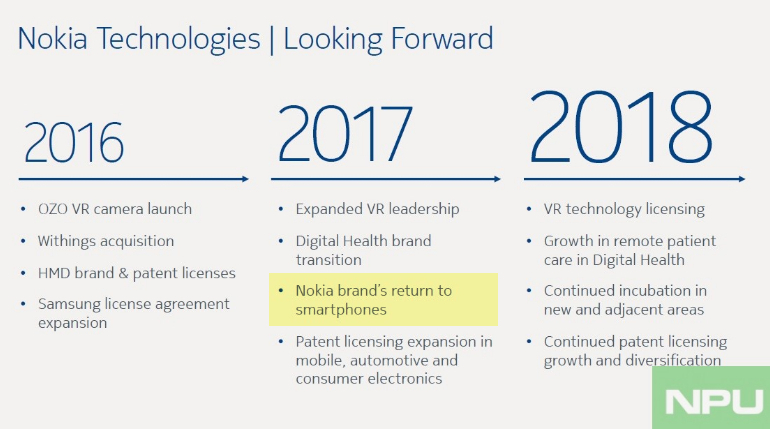 Side Note: On November 21, 2016, Nokia Power User website published a leaked corporate slide made by Nokia Technologies, which pretty much confirms that the Finnish Giant will indeed return to the smartphone game come 2017. On May 18, 2016 - 12:05 PM Helsinki Time, legendary tech titan Nokia officially disclosed that it's making a landmark comeback to the mobile devices industry via a strategic agreement covering branding rights and intellectual property licensing with HMD Global Oy (HMD), a newly founded Finnish company. According to Mr. Ramzi Haidamus, President of Nokia Technologies, "[This] marks the beginning of an exciting new chapter for the Nokia brand in an industry where Nokia remains a truly iconic name. Instead of Nokia returning to manufacturing mobile phones itself, HMD plans to produce mobile phones and tablets that can leverage and grow the value of the Nokia brand in global markets." So essentially, Nokia will provide HMD with branding rights as well as valuable patent licenses in exchange for royalty payments and will work with FIH Mobile Limited (FIH), a subsidiary of Foxconn Technology Group as well as the remainder of Microsoft's feature phone business assets for the manufacturing, sales and distribution of upcoming Nokia-branded Android mobile devices. The Finnish Giant also reassures consumers that new Nokia-branded mobile devices 'will exemplify what consumers have come to expect from all Nokia devices, including quality, design, and innovation'. To achieve that, it goes without saying that Nokia will have to work closely with FIH Mobile Limited in crafting new smartphone and tablet models if not altogether be the brains behind these upcoming products. Sure, Nokia will no longer buy raw materials and hire labor to craft its own handsets but it's not like the company will just plaster on its name on devices made by another company. There's a process involved in creating these products and from what I've read, it appears that Nokia will have to be there every step of the way to ensure that new releases bearing its branding will be up to par. If anything, that's what makes me feel excited about this imminent comeback. I want to see if Nokia will be able to deliver on this promise. Because if it can, then we could very see another major change in the global mobile landscape.